The 2014 NFL preseason continued with 46 former Florida Gators spread out over 23 of the 32 teams in the league. 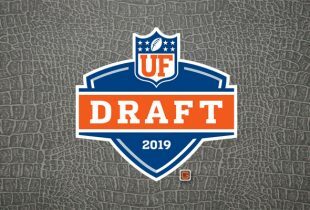 Fifteen teams have multiple Florida players on their rosters including Miami and Tampa Bay (four each); Baltimore, Indianapolis and Philadelphia (three each); and Buffalo, Cincinnati, Cleveland, Denver, Kansas City, Minnesota, N.Y. Jets, Pittsburgh, St. Louis and Washington (two each). Below are full game statistics for all 36 players that saw action along with select updates on some Gators during the third week of the preseason. » Starks was cut Monday afternoon by Arizona. » Hill will be suspended for the first six games of the season for drug use. » Jacobs was cut Monday morning by Buffalo. » Grossman was signed by Cleveland last week after its first preseason game. » Mincey is the first player out of UF on Dallas’s roster since 2002 (Emmitt Smith). » McCray missed his entire rookie season in 2013 with an ankle injury. » Nixon had a knee scope two weeks ago and is expected to miss one more weeks. » Hammond spent his rookie year in 2013 on Kansas City’s practice squad. » Easley is still recovering from a torn ACL suffered during his senior season at Florida. » Demps has played just two games in two NFL seasons after being stashed on injured reserve in 2012 by the Patriots and placed on IR by the Bucs (groin) in 2013. » Reed only played nine games as a rookie, missing seven (six-straight to end the season) due to concussion-related symptoms. You keep worse hours than I do, lol.